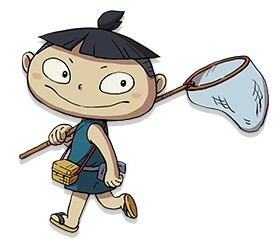 Zashiki-warashi are incredibly fast and help people by causing minor good fortune such as preventing spills. He takes his name from the zashiki-warashi, a child youkai that takes residence in large houses with tatami floors. This youkai will inhabit one of the rooms and will rarely be actually seen: the house's guests will only hear the sound of his little bare feet treading the tatami mats, and occasionally fall victim to his innocent pranks. It's said that so long as he stays in the house, the residing family will be blessed with good luck.